: The lights are turned ON or OFF by pressing the corresponding switch. : The light turns on when a door is opened or when a door is unlocked by the transmitter (if equipped). 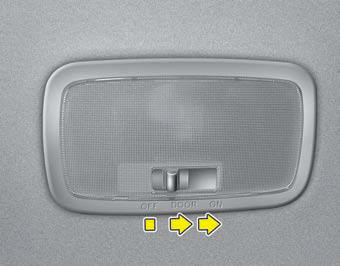 Interior light goes out slowly after 30 seconds if the door is closed. However if the ignition switch is ON or all vehicle doors are locked when the door is closed, interior light will turn off even within 30 seconds. : The light turns on and stays on even when the doors are all closed. : The light stays off even when a door is open. Do not use the interior lights for extended periods when engine is not running.